This is the container that holds most of my 72 hour kit. A paracord tied around the outside makes a functional pail handle. Use the BOT to collect water and treat it (by boiling). 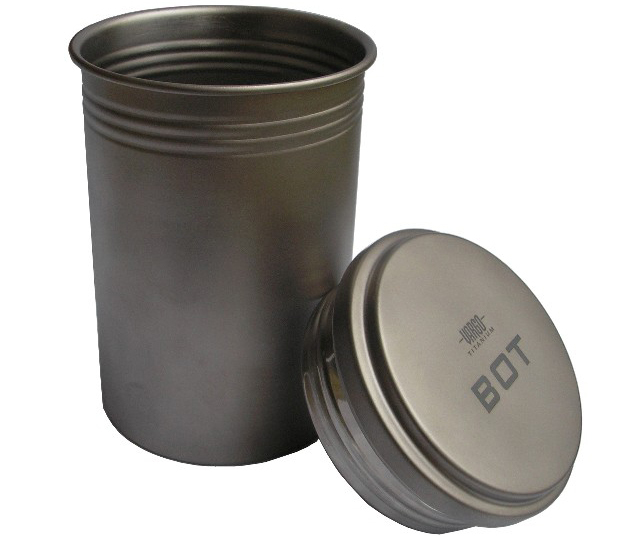 The BOT lid is an 8oz/1 cup/500 ml cup that screws on to seal it (use as a canteen). There is a ridge inside the lid that marks the 4 oz/1/2 cup/250 ml point. To use this as a double boiler while cooking, place something in the inverted lid while the water is boiling in the bottom section. Vargo makes a silicon lip protector to attach to titanium mugs. The lip protector will fit on the BOT. MSI provides the coffee percolator conversion here. Cut down the percolator basket (about half height) and trim an inch and a quarter from the stem top using a Dremel. The new size basket will provide the maximum amount of coffee that the BOT will hold (4 cups). This will also reduce unnecessary weight. Use the BOT as an oven for cooking biscuits or muffins by stacking two 5 ounce tuna cans. Use an old wire coat hanger to create an insert that lifts the bottom tuna can up 3/4 of an inch, creates a shelf for the second can to rest on, and leaves a loop at the top to lift the cans out. Use a lid removing can opener on the tuna cans so that you can get the muffin or biscuit out of the can (can lip is not in the way). Make Hot Chocolate by melting some cocoa in the lid while boiling water. When the chocolate melts pour it and evaporated milk into the boiling water. Hot chocolate.